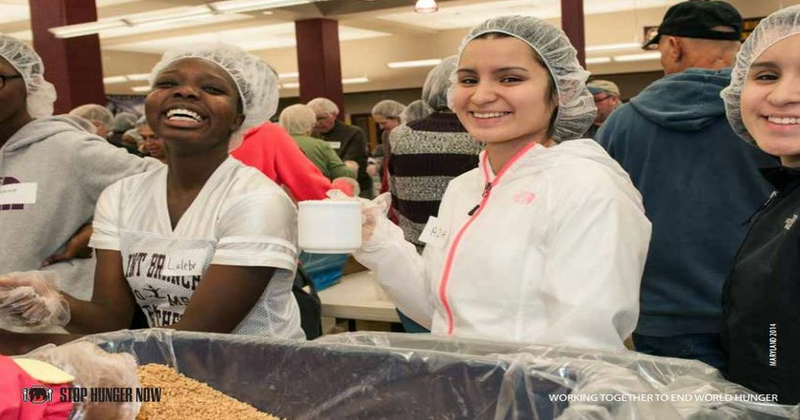 Qlik teamed up with Stop Hunger Now to package 10,000 meals for those in need. The Qlik Newton office recently took part in a fun volunteer event meal hosted by the Stop Hunger Now organization, whose mission is to eliminate hunger throughout the world. They distribute meals through feeding programs operated by partner organizations primarily in schools in developing countries. About 30 Qlik employees volunteered for the “Change Our World” program event, bringing along family members, friends, and children as well. There was a job for everyone, even the littlest of hands. There were four stations set up where volunteers measured, weighed and sealed the meal pouches. Other volunteers counted and packed the meals for shipping, while the rest refilled the food and restocked supplies. In only two hours, the Newton office volunteers were able to pack 10,000 meals! Qlik also made a monetary donation which covered the cost of the meals. The event was lot of fun for everyone who participated – music was playing, refreshments were served, and kids banged on a gong every 1,000 meals to make everyone aware of their progress.